What Should Be Used First: A Sauna or Steam Room? Saunas, which provide dry heat usually through super-heated rocks, have average temperatures from about 160 to 200 degrees Fahrenheit. Humidity levels tend to be low, ranging from about 5 to 30 percent. Steam rooms have temperatures around 110 degrees with 100 percent humidity, making them easier to withstand for longer periods of time. It is sensible to start first with the sauna and then to finish up with a more relaxing time in the steam room. 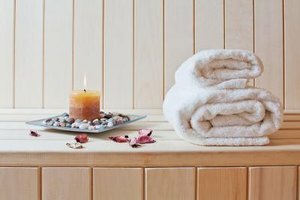 Both saunas and steam rooms provide essentially the same benefits. The high heat will open up your pores, cleansing the outer layers of skin. Overall, this heat will temporarily lower your pulse and your blood pressure while causing you to sweat out salts from your body. There is no scientific evidence that either one aids in weight loss. Try both the sauna and the steam room and decide which one is right for you. If you enjoy the drying effect a sauna has after the steam room, go for it. Both rooms provide the same benefits, so it's really a matter of personal preference whichever you do first. Just remember to stay hydrated and to get out if it starts to be too much.